Huawei has been scheduled to launch its flagship smartphone in October, which will become Huawei Mate 10. As with other flagship, the smartphone will come with a bezel-less design on the front, including the top and bottom. Well, recently the company has uploaded a teaser that reveals the front and rear design of Mate 10. 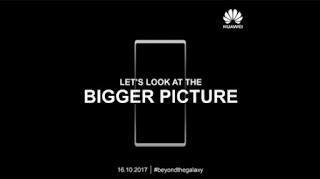 Uniquely, this Chinese-origined company rushed to the Samsung Galaxy Note 8 recently announced by using hashtag #beyondthegalaxy. For the first teaser reveals the front design of Mate 10 which will be dominated by the screen, even the screen is bigger than the screen belongs to the Galaxy Note 8 which Samsung has just released. But that does not mean its size also widened, by trimming the thinner bezel, Huawei Mate 10 will get a wider screen than other smartphones of the same size. 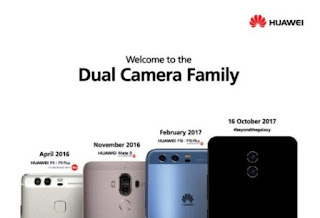 While the second teaser shows the design of Huawei Mate 10 from behind. Although not showing any brand, but things to know that the smartphone still inherits the dual-camera setup on the back. In fact, the placement of the rocker volume and power button is still the same as its predecessor. Because this teaser is uploaded on the company’s official Twitter and Facebook accounts, no doubt the accuracy of the design. Huawei Mate launch itself is expected to take place on 6 October.